Online Publishers and Encyclopedia sites were among the biggest gainers in Google search visibility in 2017, while three social media sites – reddit.com, tumblr.com and pinterest.com – experienced the biggest losses according to a new study. Over half of the top 100 sites that saw the biggest gains on Google.com during 2017 are publishers of articles or video content on general interest topics and tech, but many publishers also experienced losses. The runner-up category amongst the winners in 2017 was encyclopedias (including dictionaries, translation sites etc. ), which saw enormous increases in their visibility. Google-owned YouTube was the overall winner in search visibility in absolute terms taking the number one spot in the winners’ list. At the same time, other video platforms were on the losers list e.g. vimeo.com and dailymotion.com. Interestingly, those that lost search visibility, were hit even harder in mobile searches than desktop searches. The data, which is published in a Searchmetrics blog post, is based on an analysis of the change in search performance for each website during 2017 (where search performance is measured by the SEO Visibility¹ score, an elementary indicator for measuring a webpage’s performance in organic search developed by Searchmetrics). Among the well-known publications on the winners list were imdb.com, usnews.com, theguardian.com, usatoday.com, thesun.co.uk, washingtonpost.com, cnbc.com and bbc.com. There were also many tech sites including theverge.com, techcrunch.com, engadget.com, gizmodo.com and techradar.com. At the same time many publishers were also found in the losers list, including the likes of perezhilton.com. When Searchmetrics analyzed the 250 top winners and 250 top losers by industry it found the ‘media and events’ category made up around 57% of winners and also 44% of losers. Many of the losers also come from the category search/portal – domains like msn.com. Another group that is well-represented amongst the losers is music/lyrics – e.g. azlyrics.com or metrolyrics.com. Fred Update: Another update that was not confirmed by Google bears the nickname “Fred”. This came in calendar week 11, which was the most turbulent of the year. According to Search Engine Land, ad-heavy websites with low-quality content were worst affected by this update. Among the dictionary and encyclopedia sites that saw the biggest gains are merriam-webster.com, wikia.com, dictionary.com, wiktionary.org, britannica.com and thesaurus.com (all these were in in the top ten winners list). This was part of a trend throughout the year that saw Google rewarding dictionary/encyclopedia domains for short-tail keywords (consisting of only one or two words) that do not have one clear user intent (e.g. to purchase). A major factor in this trend was the Dictionary Update: which took effect in June 2017. This created (even more) visibility improvements for dictionary domains. These URLs improved their rankings first and foremost for short-tail keywords that could have various different user intents. Possibly Google assumes that the people using the short-tail keywords are looking for definitions – which are best found in online dictionaries/ encyclopaedias. 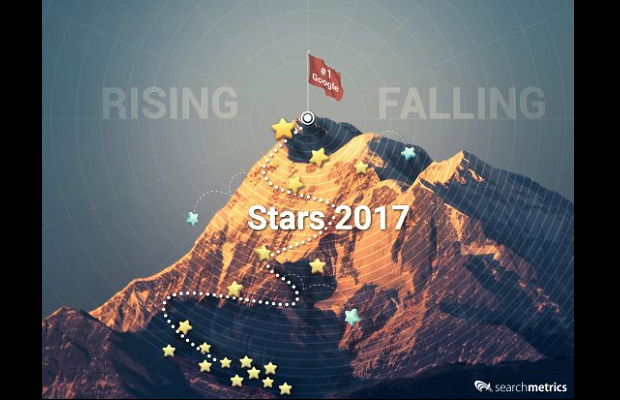 2017 was a tough year for social media sites, with several domains in this category seeing dramatic losses. In fact the top 3 losers were all social media sites: reddit.com. tumblr.com and pinterest.com. Other social sites that experienced visibility losses were myspace.com and quora.com. Domains that lost out in 2017 also saw bigger drops in Google’s mobile index than on desktop. At the start of the year, visibility in desktop and mobile visibility searches were often around the same, yet as the year progressed, many domains – even though they had mobile versions – saw much greater losses on mobile than on desktop. For example, tv.com’s mobile visibility was 41% below its desktop visibility as the year closed, for perezhilton.com it was 42% lower and allmusic.com had a mobile visibility 43% below its desktop performance. So, websites need to prepare for how Google is seeking to improve people’s mobile user experience with its Mobile Index update which is planned for 2018 – and the recently announced Google Speed Update coming in July 2018. For the evaluation of the biggest winners and losers in 2017 Searchmetrics analyzed the change in the SEO Visibility of all domains included in our Index over the course of the year. The lists of winners and losers is sorted by absolute change. While SEO Visibility can relate to a website’s real traffic, it is important to remember that traffic can come from many different places online. SEO Visibility is only an indicator of visibility that comes from a website’s organic search channel.